Joy is the precursor to the truest refreshment. WELCOME TO 7 STEPS TO CREATIVE CLARITY! THANK YOU so much for your purchase of my course, 7 Steps to Creative Clarity! Welcome! Below, I have provided for you a Welcome, the Information about the course and PDF downloads that contain all the journaling, art journaling and doodle prompts. I also have provided a link to each post which includes a video-based introduction, each of the seven steps, as well as a written and audio summary/conclusion to the course. You will find video, audio, and text, a wonderful multi-media experience for you that includes journaling, art journaling and doodle prompts, plus encouragement and validation from me, as your host and Creative Visionary. My greatest desire is to see you initiate more joy and gain some serious creative clarity in your every day life as a result of taking this course. refreshwithdawnherring@gmail.com and let me know, and we'll get that resolved promptly. 7 Steps to Creative Clarity private Facebook Group. Thanks again for your purchase and for joining me on this Creative Clarity Journey! ​May JOY find you in the most unexpected places. Note: This course is intended for your personal pleasure and is not meant as use for therapy. Please see your counselor, doctor or psychotherapist. Where Finding JOY Takes Center Stage! 7 Steps to Creative Clarity. 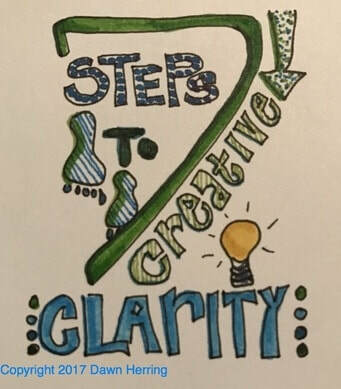 Each Step of the 7 Steps to Creative Clarity has its own link to a post published on my website. and insight, both in text form and in audio. I chose to create video/audio so I can speak to you directly as I share my thoughts for each step as it can directly make a difference in your Creative Practice. I want this course to feel like it was created Just For You, because it really was. one that you look forward to engaging in every day, that will lead to creating positive change that brings personal empowerment into your life! Since there is a link to each step, you are welcome to peruse, watch, and listen at your own pace. You may want to start out doing it in order just to get a feel for the contents and what they can do for you creatively. Once you’ve done that, you are welcome to tap into the contents in any order you desire, making it an intuitive choice based on your current creative needs. This gives you the opportunity to really listen to what your creative heart is telling you it needs right now. The more you listen, the more you can benefit from tapping into what is innately in you, that spiritual gift of Creativity and insight just waiting to be heard and followed, so you can experience great JOY every day. Thank you so much for choosing to Journey with Me through 7 Steps to Creative Clarity! I am eager to share your Creative Journey with you! You are welcome to leave comments on each post of the course, sharing your favorite exercises/prompts and what a difference the insight you have gained has made for you! You can also join us on our 7 Steps to Creative Clarity Private Facebook Group where we will share encouragement, support and validation for your Creativity and your Creative Desires and Dreams. Note: If any of the prompts or exercises make you uncomfortable, please move on to the next. This course is for the purpose of joy-filled creativity and fun. 7 STEPS TO CREATIVE CLARITY!! See JOY File to download Prompts. See Nurture File to download Prompts. See Intuition File to download Prompts. ​See Curiosity File to download Prompts. ​See Alignment File to download Prompts. See Experimentation File to download Prompts. See Connection File to download Prompts. to the 7 Steps to Creative Clarity! You are welcome to stay in touch.